Project Title: What’s Watt in De Aar? An exploration of local energy needs and challenges in a renewable- energy in the Karoo region of South Africa. Stef’s overarching interest is in the potential of South Africa’s renewable energy sector to contribute to sustainable development at the local as well as national level. Her MA thesis focuses on exploring the energy needs and challenges that poor households face in De Aar, in the Northern Cape, in relation to the significant national and international investment in renewable energy which is currently taking place around the town, as part of South Africa’s Renewable Energy Independent Power Producer Procurement Programme (REIPPPP). Stef enrolled for a BA Humanities degree at Stellenbosch University which she completed in 2015. In 2016, Stef completed her honours in Sociology on the public participation process of shale gas development in the Karoo. 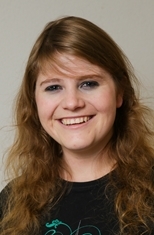 She is currently enrolled for her MA in Sociology at Stellenbosch University.